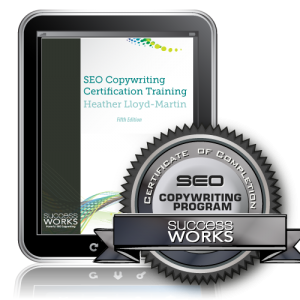 The SEO Copywriting Certification is the only industry-endorsed online training that certifies copywriters in SEO copywriting best practices. Trusted by these companies – and more! Throughout my SEO copywriting career (over 20 years now! ), I’ve trained thousands of writers around the world. SEO copywriting is complex. But we can make it fun, too. I’ll lead you through every step of the way. Find out why Certification is a smart career move. Are you wondering if you’re optimizing pages the right way? Do you want to command higher fees and help large clients with their SEO content campaigns? Let me help. The SEO Copywriting Certification training teaches you the specialized knowledge you need, in a fun, supportive environment. Discover how Certification can help boost your income. View testimonials from happy Certification graduates. — Stewart WrightProduct Manager, LifeLearn Inc. Endorsed by organizations such as seoPros.org and AWAI, the SEO Copywriting Certification training is a self-directed training focused on web content and social media writing. The materials are continually updated, reflecting the latest search engine changes. Plus, you’ll have the opportunity to receive feedback on their writing. You will have lifetime access to this training, including access to all training material updates. Gain the confidence you need to success in the fast-paced world of SEO. Please contact me with your questions – I’m happy to help!